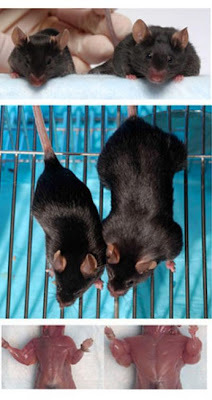 The Johns Hopkins scientist who first showed that the absence of the protein myostatin leads to oversized muscles in mice and men has now found a second protein, follistatin, whose overproduction in mice lacking myostatin doubles the muscle-building effect.Results of Se-Jin Lee’s new study, appearing on August 29 in the online, open-access journal PLoS ONE, show that while mice that lack the gene that makes myostatin have roughly twice the amount of body muscle as normal, mice without myostatin that also overproduce follistatin have about four times as much muscle as normal mice. Lee, M.D., Ph.D., a professor of molecular biology and genetics, says that this added muscle increase could significantly boost research efforts to “beef up” livestock or promote muscle growth in patients with muscular dystrophy and other wasting diseases. “To my surprise and delight, there was an additive effect,” said Lee, who notes these muscular mice averaged a 117 percent increase in muscle fiber size and a 73 percent increase in total muscle fibers compared to normal mice. This entry was posted in biotechnology and tagged genetics on August 31, 2007 by Jay.